Which of these smart displays deserves a place in your home? Now there's a smart speaker in every home, the next must-have device for gadget lovers is the smart display – it's like a smart speaker, but it has a screen. 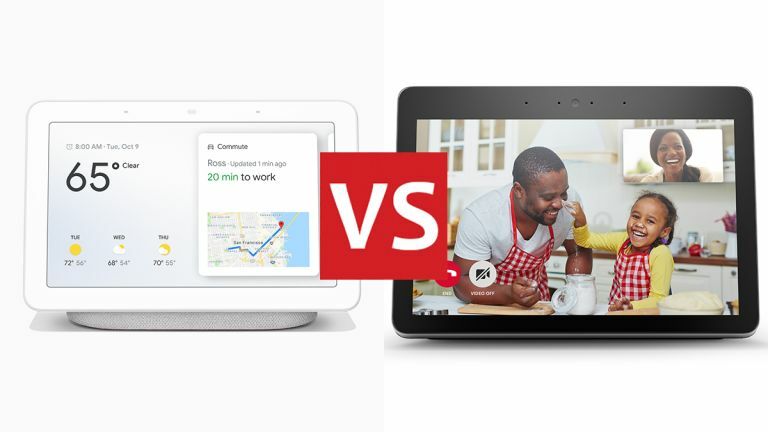 At the moment, the two devices dominating the market at the Google Home Hub and the Amazon Echo Show. So if you're wanting to give your smart home an upgrade, which is the best buy? Here we'll compare the Home Hub and the Echo Show in all the key categories, explaining how they differ between them – and helping you decide which one should be on your shopping list. Both these smart displays are elegantly designed and will fit seamlessly into your kitchen or bedroom aesthetic – and the Echo Show is now in its second, better-looking incarnation too. Amazon's gadget is the bigger and the heavier of the two, weighing in at 1,755 g (3.9 lbs) compared with the 480 g (1.1 lbs) of the Google Home Hub. The Google Home Hub comes with a 7-inch LCD touchscreen and measures 178.5 mm x 118 mm x 67.3 mm overall (that's 7.03 inches x 4.65 inches x 2.65 inches). You can pick it up in four colours – sand, aqua, chalk and charcoal. Overall, we just about prefer the lines and curves of the Google Home Hub in the design stakes, though there's not much in it. As for the Amazon Echo Show, you get a significantly bigger 10.1-inch LCD display (and a bigger speaker, too). The dimensions are 246 mm x 174 mm x 107 mm (9.69 inches x 6.85 inches x 4.2 inches), so you're going to need more room on your table or desk to stand it, and you've got a choice of two colours: black or white. When it comes to smart displays, there aren't really that many specs to talk about – we've already mentioned the display sizes in the last section, and we'll get on to the smart digital assistants in the next section. Both the Google Home Hub and the Amazon Echo Show are designed to answer voice commands and bring up information on their displays. And with that in mind, they both do a fantastic job, but there are a few differences. The Echo Show has dual speakers powered by Dolby, and a front-facing camera; the Home Hub has a single speaker without Dolby accreditation, and doesn't have a camera (for privacy reasons, Google says). Both can pump out the tunes very satisfactorily, but you're going to get more oomph from the Amazon Echo Show. Both smart displays bring with them Bluetooth connectivity but no 3.5 mm audio jack, so you can't hook up another speaker or music source with a cable. As for listening, the Echo Show has eight microphones embedded in it, while the Home Hub makes do with two – though both should be able to hear you clearly enough, even if there's some background noise around to interfere. The key difference between these smart displays is of course the smart assistant embedded into them: Google Assistant on the Google Home Hub and Amazon Alexa on the Amazon Echo Show. Which device you end up buying may well depend on which of these assistants you're already most friendly with. There's no quick answer as to which one is actually better – in fact they're both very good and getting better all the time. You really need to think about which services you want access too – Amazon Prime Video or YouTube? YouTube Music or Amazon Prime Music? That's then going to point you in the right direction when it comes to which smart assistant will be most useful. Both the Google Home Hub and the Amazon Echo Show can control a host of smart home devices – see the lists here and here. Indeed one of the main reasons you might want to pick up one of these smart displays is to be able to control your smart lights and your smart thermostats with your voice, so make sure you're buying a gadget that's compatible with the kit you've already got (or are going to get). As we've mentioned, your biggest decision here is whether you want to go with Google Assistant and Google apps (like YouTube), or Amazon Alexa and Amazon apps (like Amazon Prime Video). After you've made that choice, everything else is secondary, though it's still worth knowing about the various specs and features of each gadget. The Amazon Echo Show is substantially bigger than the Google Home Hub, in terms of both the size of its screen and the amount of power it can put behind its audio – that's something else to consider if you're thinking about which of these devices to install in the centre of your smart home setup. The Amazon gadget also has a front-facing camera, enabling video as well as audio calls. In terms of what these smart displays can actually do though, there's not much else to choose between them. Both will tell you about the weather and your upcoming calendar, both will play music and podcasts for you, and both can carry out several actions based on one voice command. Last but not least, the cost – the Google Home Hub is significantly cheaper than the Amazon Echo Show, though check out the widgets on this page for the most up-to-date prices.